Everything ABOUT the kitchen sink! The kitchen sink may not be focal point of your kitchen but it’s certainly an area that gets a great deal of use plus – and you might not think it – it’s an opportunity to make a style statement. The default stainless steel sink with drainer is not your only option and choices range from traditional under-mounted Belfast sinks to high modern integral ones. We are therefore dedicating this month’s kitchen trend blog to the humble sink so here's a quick guide to what’s available. Inset or drop-in sinks – these are the most common type and easiest to install. Simply sinks that fit into a hole cut into your counter top. Available in different metals, composite and ceramic. Now that these materials can be manufactured to very thin dimensions, these can look almost flush and also allow you to have an integral drainer. One disadvantage is that crumbs and dirt can collect around the edges where it meets the worktop. Flush-mount sinks – as the name suggests, these are sinks that run flush to your counter top and create a lovely continuous surface. They take a little more installing than an inset sink but allow you to have a one piece sink and drainer. They offer a middle ground between an inset and an under-mounted sink. Under-mounted sinks – these sit below the work surface so that your counter top material runs over the top. This creates no edges for crumbs and dirt and looks very elegant, however you can’t have a traditional drainer area (though you can have grooves cut into your counter if it is a material such as granite). The sink can be completely contained on all sides by your work surface or could be exposed at the front such as a feature Belfast sink for example. Integral sinks – these sinks that are part of the worktop, ie moulded in the same piece or manufactured from the same material. These create a sleek look and are very easy to keep clean as there are no nooks and crannies to collect dirt. They work best in granite or composite but be warned – if the sink ever needed replacing it would mean an entire section of worktop which could be a big job and expensive. Metal sinks – by far the most common because of their durability and the flexibility of the material, metal sinks don’t have to be the boring old stainless steel that was once the default option. Metal sinks can be shiny, matt or brushed and in alternative metals such as steel, copper and even brass. Composite sinks – composite is a combination of materials with a resin filler, often crushed granite or quartz. This offers more flexibility, greater durability and reduced cost and weight. Composite is very hard wearing and can offer a range of colour choices. Ceramic sinks – often associated with traditional farmhouse style kitchens, ceramic sinks can look stylish in any kitchen. These often work best as under mounted Belfast style block feature sinks or can even be surface mounted but beware of cracking or chipping. Counter top material sinks – as referred to in our mounting options, sinks can be made from the same material as your counter if it’s granite, metal or composite, creating a sleek, continuous look. By sink configuration we mean the way you combine the shape and the number and the size of your sinks. Most people opt for more than one sink these days as it’s really useful to have one for washing and one for draining, rinsing or soaking. You can have them as separate sinks or buy combined units and of course you can go for two full size ones or have one and a half sinks. Some like a very symmetrical look with two sinks exactly the same while others like to create interest by combining different sizes and shapes. There would be too many possibilities to describe them all here so we’ve simply shown a few options. There is a much wider range available on our Pinterest board. We hope that these options give you a few ideas and that you no longer think the kitchen sink is boring! As well as the small selection of images here we have a much wider range on our kitchen sink Pinterest board so please take a look over there as well. Sinks, handles and accessories often seem to be an afterthought when designing your kitchen when some careful consideration could use these features to give your design real flair. If we can help with this process then please give us a call on 0800 321 3491 or arrange for a design consultation. See all our monthly kitchen trend blogs today here. 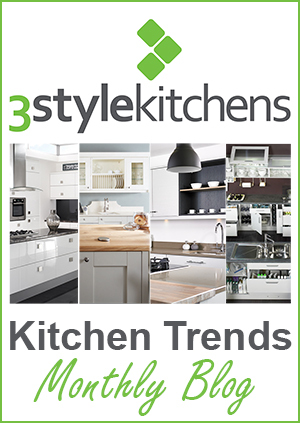 0 Responses to "Kitchen Trends Monthly Blog - May"